Jamestown Rediscovery Foundation archaeologists show artifacts and discuss what they know about one of the first enslaved Africans to live in English North America in Jamestown, Va.
A Jamestown Rediscovery Foundation archaeologist shows artifacts and discusses what they know about one of the first enslaved Africans to live in English North America in Jamestown, Va. They’re standing at the excavation site of a house where an enslaved woman named Angela lived in the 1600s. JAMESTOWN, Va. – On a recent afternoon, tour guide Justin Bates pointed to the spot where historic Jamestown’s legislature first convened in July 1619. He then gestured toward another nearby spot where some of the first slaves in English North America arrived a few weeks later. 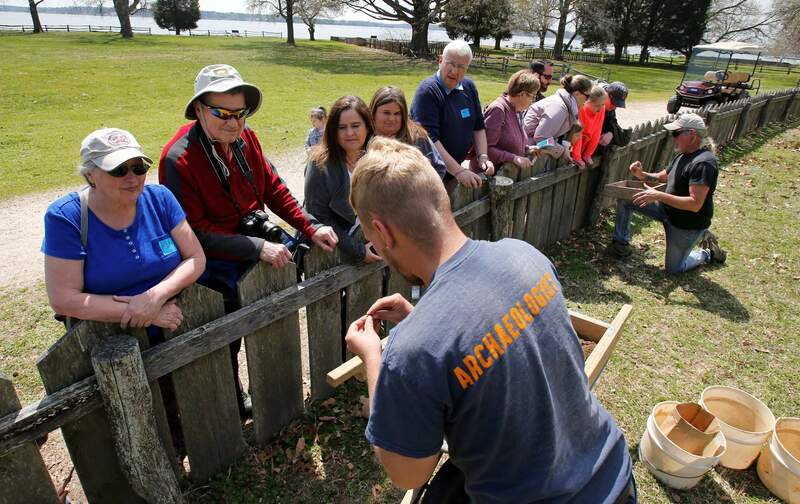 A Jamestown Rediscovery Foundation archaeologist discusses what they know about one of the first enslaved Africans to live in English North America in Jamestown, Va. A new tour at the site of the historic Jamestown colony encourages visitors to consider the beginnings of American slavery. It’s part of a broader national effort to reckon with slavery’s legacy. English colonists took the Africans, who came from what is now Angola, to properties along the James River, including Jamestown. A visitors’ center and monument are planned for the landing site in Hampton. Known then as “Point Comfort,” the area is now part of Fort Monroe, a former U.S. military base owned by the National Park Service. Recognition of the enslaved Africans’ arrival also provides a counter-narrative to the claims of white nationalists that America’s roots are white. 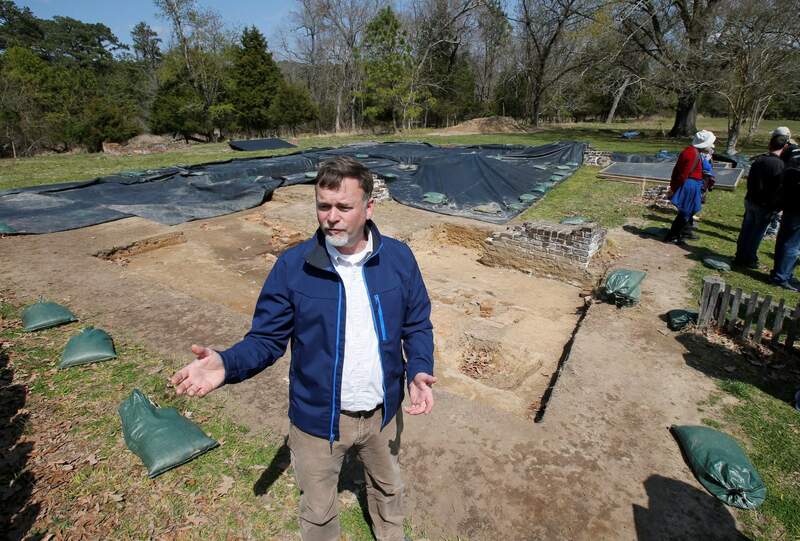 “It was not a white society with people of color as interlopers, playing bit parts,” said James Horn, president of the Jamestown Rediscovery Foundation, which oversees archaeological digs there. 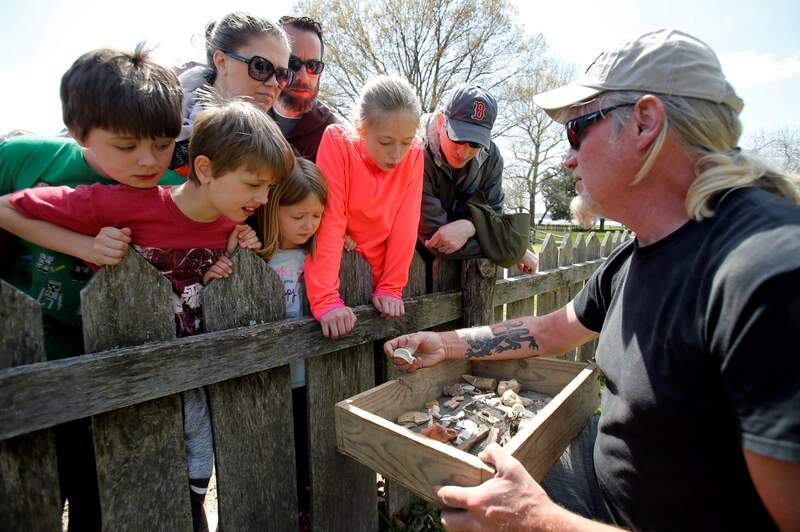 A Jamestown Rediscovery Foundation archaeologist shows artifacts and discusses what they know about one of the first enslaved Africans to live in English North America in Jamestown, Va. A new tour at the site of the historic Jamestown colony encourages visitors to consider the beginnings of American slavery. It’s part of a broader national effort to reckon with slavery’s legacy. The structure no longer exists. But archaeologists with the National Park Service and Jamestown Rediscovery have uncovered its brick floor and located the kitchen area where Angela likely worked. The “First Africans” tour includes the excavation site as well as a spot on the river where Angela likely first stepped off a boat into Jamestown. “Think about what that must have felt like,” Bates recently told a group of visitors. 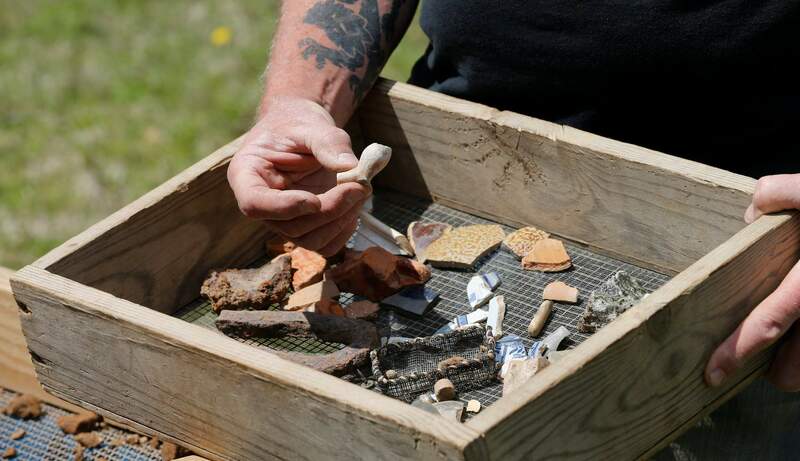 Kym Hall, the National Park Service’s superintendent of Colonial National Historical Park, which includes Jamestown, said tears have been shed at the excavation site. Some of those tears were her own. “We hope to bring some empathy and connection and understanding about these stories of origin,” she said. Some historians are wary of focusing too much on 1619. Davidson College professor Michael Guasco has written that the Africans’ arrival in Virginia was just a “blip on the radar screen” in the larger context of slavery. More than 500,000 enslaved Africans had already crossed the Atlantic to other European colonies, including places that later became part of the United States. “Virginia was still Tsenacommacah, Europeans were the non-native species, and the English were the illegal aliens,” he wrote in September for Black Perspectives, a blog for the African American Intellectual History Society. Those working at Jamestown have sought to address such concerns, emphasizing its shared racial history. Bates, the tour guide, charts the history of the European slave trade and the growth of American slavery. He also details the evolution of colonial laws, many passed in Jamestown, that created a race-based system of enslavement. Jill Williams, a black woman who recently visited the excavation site with her husband and son, said she was unaware of Angela’s story until she arrived in Jamestown. “It’s nice to go somewhere and know there’s a story about your people. That doesn’t always happen,” said Williams, 52, of Hempstead, New York.